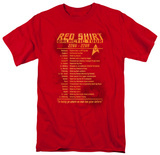 “Redshirt” (or “red shirt”) referred to a generic character who was destined to suffer a tragic fate within a storyline. The term originates from Star Trek: The Original Series, which ran from 1966-1969. The science fiction show dressed stock characters in red shirts and often featured them perishing in an episode plot. If you assumed these were random occurrences, think again. An analysis concluded that of all the 59 characters not surviving beyond a single episode, 43 of them wore red shirt uniforms. Two Star Trek franchises paid homage to the red uniform omen: a Star Trek Deep Space Nine episode titled “Valiant” that featured a group of cadets called Red Squad meeting their destructive end within that episode, and in the J.J. Abrams Star Trek movie reboot where a character named Olson (wearing a red shirt) was quickly incinerated on a mission. 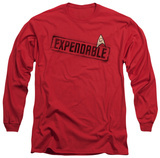 The red shirt foreshadows a Star Trek character’s on-screen demise. 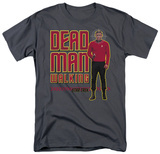 At Allposters.com, we feature several Star Trek apparel items that pay tribute to the Star Trek red shirt mythos. 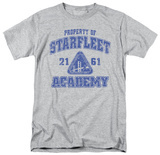 If you’re a Trekkie, you’ll appreciate the homage and may want to add them to your own collection. 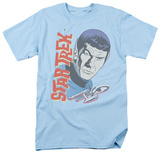 If you interested in browsing other Star Trek posters and Star Trek shirts in our collection, visit our merchandise category to view more products.